Hi there and welcome back friends! And if you are new to Living 511, let me take a moment to introduce myself. I am Renee and this is where I blog (sometimes) about our faith, home decor and design. I love all things home and would definitely consider myself a homebody. I have a wonderful husband, Charles, who shares my passion for DIY projects (well maybe not as much as I do, HA), historic homes and shopping our local flea markets for antique and vintage finds. Together, Charles and I make up Living 511 and we hope that you enjoy your time here. My dear friend Abbie from The Gray Cottage reached out to me and asked if I would like to participate in a “simple” fall home tour with her and a few other bloggers. I immediately replied yes. It was the word simple that captured my attention in her invitation. I have discovered through much trial and error that I take the “less is more’’ approach to decorating our house and simple decor is more conducive to the way we live every day in our home. So grab your coffee and take a little tour of our Cotton Mill House. Charles and I purchased the Cotton Mill House in the spring of 2017. It was a fixer upper in much need of some TLC. We have been working on renovating and updating this home over the last year. Although we have accomplished a lot, there is still more to do. Our favorite spot to have our morning and evening coffee is on this porch. The best part is saying hello to the neighbors that pass by which adds to the charm of living in a small town. Our home has two main entrances. The entrance on the left leads into the living room. Upon entering our home, you will see new furniture pieces with clean, modern lines mixed with antique pieces purchase from Craigslist. We love mixing the old with the new to create a look that we love. Seasonal decorating consists of swapping out pillows, adding a simple flower arrangement and updating the framed art. The berry and green color palette was inspired by the faux blooms that were on clearance for .99 cents at Michael’s. For a more realistic look, I simply added the faux stems in a vase with water along with some seeded eucalyptus as a filler. Since this is not our primary residence, maintaining real flowers and plants is not an option. On the mantle, I simply switched out the stems in the grey vases and changed out the candles. Again, I incorporate simple and easy changes when decorating our home for the season. Our dining room is located at the entrance on the right side of our house. This room size is identical to the living room and also features a fireplace. All of the furniture in the space was purchased second hand off of Craigslist. I searched almost every day for months for furniture pieces that had simple, clean lines that would compliment each other and work in the space. The white dining chairs were a must have but I could not find any that were within my budget. I came across a set of 6 Ikea dining chairs on Craiglist. The owner was willing to sell the two arm chairs separately. I then purchased inexpensive white cotton slip covers from Bemz and was able to achieve the design I wanted for a fraction of the price. In the dining room, I used more of the faux flower stems, eucalyptus, dried flowers and candles for our fall decor. On the cabinet, I gathered a set of white modern vases and added dried flowers to each of them flanked by 2 candle holders that I purchased last year from Target’s clearance section. The framed print is lyrics to the song “It Is Well” by Kristene DiMarco. It is one of our favorites and has special meaning to us both. I knew that I wanted a place for these lyrics somewhere in our home. Another one of my favorite second hand pieces is the dining room chandelier. We purchased it from the Habitat ReStore for $15. The last room on our tour is the kitchen. Oh how this space has changed from the first time we saw it. I love this little kitchen from the two tone cabinets with Formica countertops to the custom built island. The island is decorated with crepe myrtle branches clipped from our back yard, a candle and pears purchased from the grocery store. The vase and candle holder were purchased from this year’s Target fall collection. I added the the vintage pear print above the sink that I found on the New York Digital Library website and printed for free. There are so many prints you can download at no cost. You can find the pear print here. Here is one last look at our simply decorated fall kitchen before you go. You can click here to see the before photos and learn more about the Cotton Mill house. That concludes our first official fall tour of our Cotton Mill House. YEAH!!!! Thank you so much for stopping by and visiting our blog. 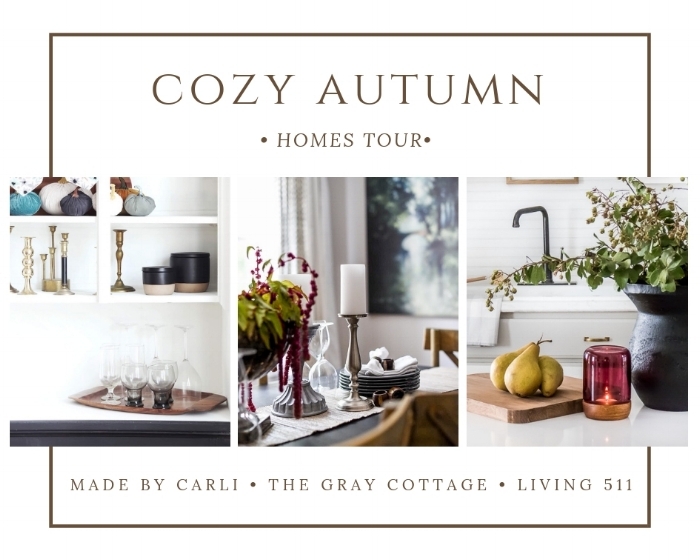 I also wanted to say a big thank you to Abbie and Carli for allowing me to be a part of the Cozy Autumn Home tour. Be sure to visit their blogs to see more simple fall inspired decor and ideas for creating a cozy autumn home of your own.